We recently published a study of our ice finds in Oppland. The story made its way into major news media, including National Geographic. A number of posts in the comment sections to the news stories observed that the artefacts were found lying on the ground. The commenters somehow inferred that this means that global warming is fake news. This argument is wrong for two main reasons: Firstly, most artefacts were originally lost in the snow, not on the ground, where they are found now (see below). Secondly, the fact that climate change occurs naturally does not exclude that humans can have an influence on climate as well. This is just bad reasoning (non-sequitur). It is like claiming that forest fires cannot be caused by humans, because they also happened for natural reasons before humans existed. At the same time, the connection between the ice artefacts and global warming is often made in a too simplistic way. Paraphrasing again: “Global warming is leading to the melt out of artefacts, that have never been out of the ice, since they were lost in the snow millennia ago.” If this was indeed the case, we should be finding the artefacts melting out of the surface of the ice, but this is rarely the case. They are mostly found on the ground, not on the surface of the ice. So what can the artefacts from the ice tell us about climate change now and in the past? An arrow exposed on the ground in front of a retreating ice patch. It was not lost here originally. Photo: Secrets of the Ice/Oppland County Council. Why are the artefacts found on the ground? Let us start with the nature of glaciers and ice patches. These are bodies of ice that react to changes in climate, mainly winter precipitation, summer temperature, and prevailing wind direction and strength during the winter season. They shrink when there is low winter precipitation and high summer temperatures. When there is high winter precipitation and low summer temperatures they grow (it is a bit more complicated, but let’s keep it at that). Most artefacts are from ice patches, not glaciers (read about the difference between glaciers and ice patches here). Being smaller, ice patches react much more quickly to changes than glaciers. They are also more influenced by wind drift. For this reason, they expand and contract more frequently than glaciers. This has led to the melt out of most of the artefacts during the millennia since they were lost in the snow. 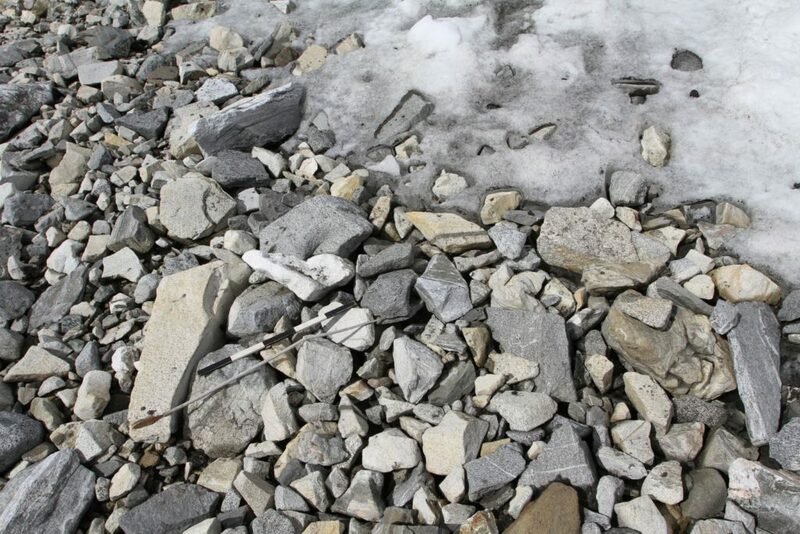 Many of the artefacts are displaced downslope by meltwater after they melt out on the surface of the ice. We actually saw this happening on our secret arrow site in 2014. The artefacts that are displaced by meltwater end up on the ground at the foot of the ice patch, even though they were originally lost further up on the ice. The frequent ice contractions and the displacement by meltwater are why most artefacts are found on the ground today. They were not lost there originally. Objects are only found on the surface of the ice when the melting reaches ice layers previously untouched by melting. This was exactly what happened on our secret arrow site in 2014, when the melt exposed intact ice layers more than 4000 years old. After the melt-out and re-deposition of the artefacts on the ground, the ice has re-covered and un-covered the artefacts on one or more occasions. Some artefacts have only rarely been out of the ice (or not at all), and have excellent preservation. Others have been repeatedly exposed to the elements and are very poorly preserved. Normally the artefacts closest to present day ice are better preserved than the artefacts further away. This makes a lot of sense: the further away from the ice, the more frequently the artefact has been intermittently exposed to the elements. The Storfonne ice patch in Jotunheimen. Notice the large light-grey area. This is the so-called lichen-free zone, where ice has melted away in the last 15-20 years. This ice patch is now probably around the size it had 3000-4000 years ago. Photo: Lars Pilø, Secrets of the Ice/Oppland County Council. What is the connection between climate and the finds from the ice? Let us start with the easy part – the present day. Is the current significant melting of the ice in the high mountains, including the ice patches, related to anthropogenic climate change? The short answer to that is yes, with a very high degree of certainty. You can read more about the retreat of mountain ice and the link to climate change here: National Snow & Ice Data Center. The Juvfonne ice tunnel during construction. 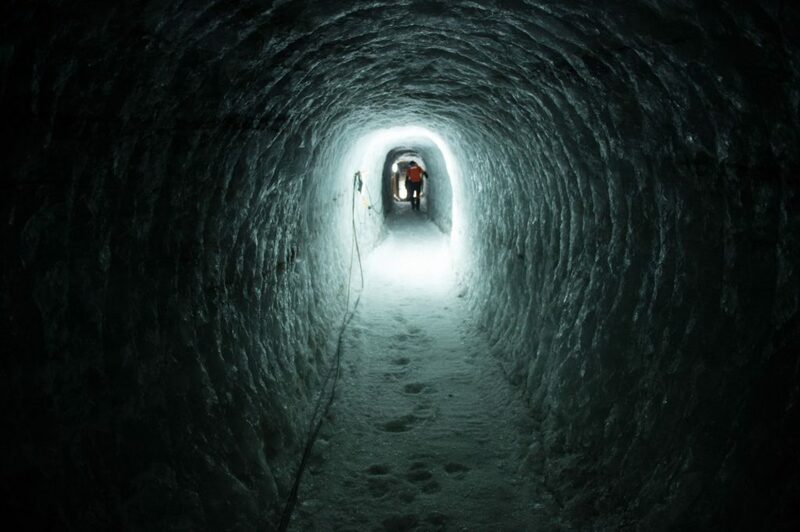 The ice at the end of tunnel is 6700 years old. Photo: Johan Wildhagen/Palookaville. But what about past climate change? How did ice patches respond to changes in climate variables such as temperature, precipitation and winter wind direction in the past? To be honest, we do not know a lot about this. Glacial archaeology and the glaciological study of ice patches are very new scientific disciplines. A tunnel in the Juvfonne icepatch has shown that the preserved ice in the Juvfonne ice patch dated from c. 6700 – 1000 years ago. These dates were made a few years back, and much of the ice younger than 3000 years ago has since melted away. Even so, the preservation of this very old ice clearly points to a resilience of the deepest layers of ice in this ice patch. 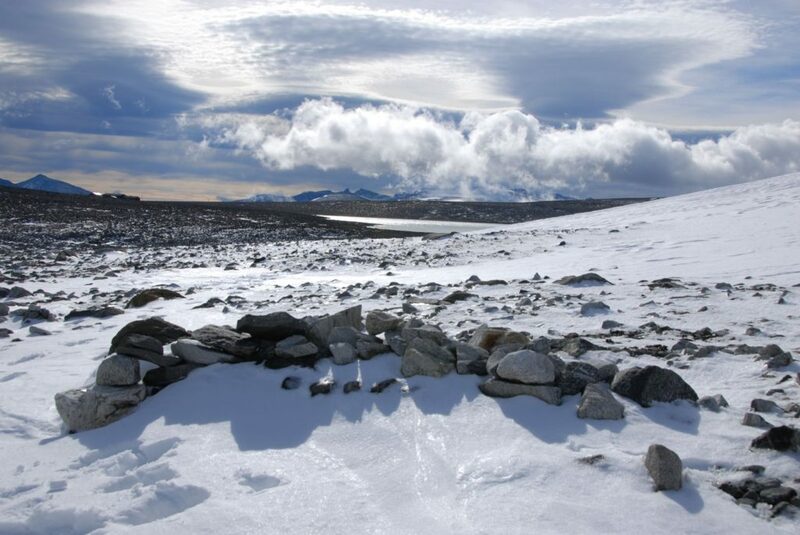 Extensive fieldwork on our secret arrow site has shown that finds older than c. 4000 years ago are situated very close to the present-day extent of the ice, and that most of the c. 6000 year old arrows melted out of the surface of the ice . The implication of this is that 4-6000 years ago the ice patch was more or less the size it is now. Younger finds, especially finds from 2000-900 years ago, are found both close to the ice and up to 100 meters away. This indicates that the ice was generally larger then. This is in accordance with what we know about the climate in the region from other sources. Stone-built hunting blind at the Juvfonne ice patch. Photo: Espen Finstad, Secrets of the Ice/Oppland County Council. Only in rare cases is it possible to gain direct information on the presence or absence of ice in the past from the archaeological finds. This is when ancient monuments melt out of the ice, and they contain datable artefacts. As the monuments must have been built on ice-free ground, this provides a date when there was no ice at a specific location. Such finds are, however, very rare. We have a few examples of this in Oppland – e.g. a hunting blind at the Juvfonne ice patch, which melted out of the ice in 2009. It contained scaring sticks, which were subsequently radiocarbon-dated to c. AD 400. However, this does not prove that the area around the hunting blind was generally free of ice at the time. It only proves that this was the case the year the hunting blind was built. Maybe in the future it will be possible to use the glacial artefacts and the preserved ice at the sites for climate history studies. At present, this is still too early. Summing up, can the finds from the ice be used to disprove anthropogenic climate change? No, they cannot. It would have been strange if that was possible. The scientific evidence for anthropogenic climate change is massive – see NASA: Climate Change Evidence and Royal Society: Climate change: Evidence and Causes. 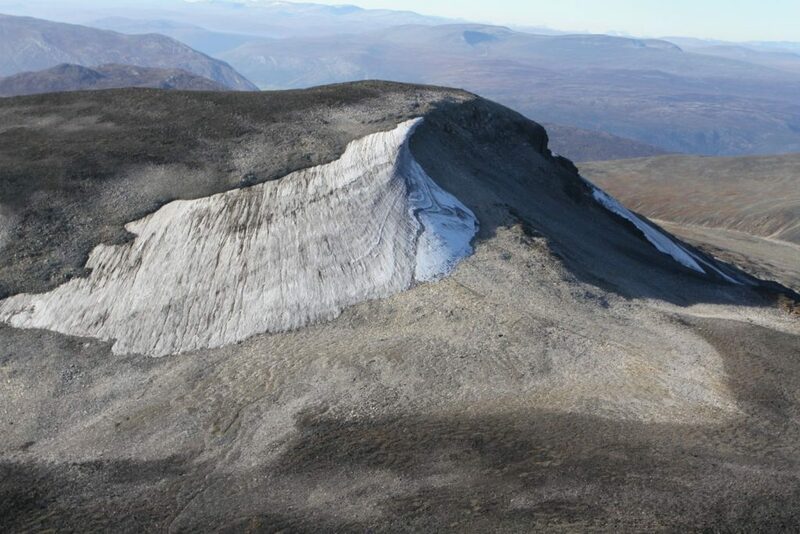 What the artefacts from the ice tell us is that that at least some of the ice in the high mountains of Oppland has now melted back to levels last seen 4-6000 years ago, during the Stone Age. The finds keep getting older, as the ice melts back. Climate science tells us that the melt-back of high mountain ice is mainly caused by anthropogenic global warming. Climate scientists tell us that the high mountain ice is going to melt, most of it in this century. What we do not know is how long the ice patches will last, as they are less well studied than glaciers. Could we lose all the ice patches here in one dramatic melt (as discussed in this blogpost) or are we looking at a process much like what is happening to the Arctic sea ice, i.e. the individual years vary, but the trend is downwards? Time will tell.